Our independent restaurant is dedicated to serving artisan quality food in big portions that are always fresh. We serve hand-tossed Neapolitan style pizza, the freshest salads, outstanding steaks and fine fish, and the most delicious sandwiches, soups, appetizers, desserts and extras. We do it all on site and from scratch – our own dough, ground meats, sauces, dips, dressings, soups and desserts. We have a full bar and a terrific wine list. 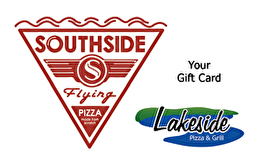 For balance inquiries call the phone number to a Lakeside Pizza & Grill's location below.